Star Wars is never going anywhere according to them. Suicide Booths are hardly ever used anymore. All historical records have disappeared for some reason. The pacing is done at random. David X. Cohen drew the design for one of the strip robots. The phrase What Are You Gay? was cut out and later used in "Amazon Women in the Mood". The lighting from the atom. The electrons make a nice effect. This episode idea comes from Star Trek with an evil Spock. The origin of the episode was when Bender was covering a beard. Leela has lots of underwear in her drawer. The Crushinator makes her second appearance. 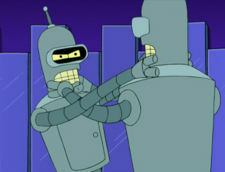 Bender was wearing a fur scarf but it was changed when anti-fur Bob Barker guested on the show. The episode makes no sense without the sentence 'I saw him steal it while Fry was asleep that's why I ran to tell Bob Barker. Matt Groening: We go into the sad music. David X. Cohen: That's a series that's never going anywhere Star Wars. David X. Cohen: Two Bender's in one show. David X. Cohen: Well it was either me or Ken. The phrase cut out of this episode What Are You Gay? is mentioned again in Amazon Women in the Mood (commentary). This page was last edited on 17 February 2014, at 03:07.